Blog: Renovate Or Update Your Bathroom? Renovate Or Update Your Bathroom? 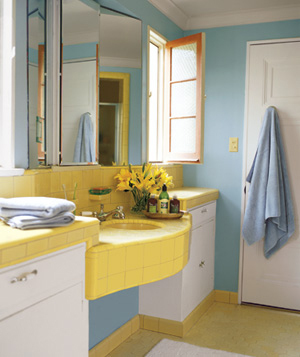 Old outdated bathrooms....update or renovate? Update! What most people don't think of when selling their home is the bathrooms... bathrooms help sell a house because people do spend time in them whether you'd like to admit it or not. f you have an outdated bathroom now is the time to consider updating it. We don't mean renovate, as renovations can be costly and they don't always mesh with your potential buyers decorating preferences; update instead! Take off the wallpaper and place a fresh coat of paint on the walls or add some tile accents or new lighting. You can find those pretty inexpensively at stores like RONA or Home Depot. To add some personal decorating touch put up a neutral shower curtain and matt but add a splash of personality with flowers, wall hangings etc. Those small additional decorating touches go along way in helping buyers envision themselves in your home.